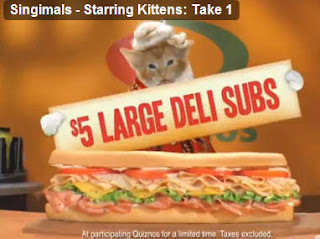 Please do not show me a commercial of furry kittens running around among my sub sandwiches. It will not help me to think of your restaurants as clean or your sandwiches as healthy or delicious. Bluck! Thank you. I was bragging to my coworker about the MOTH's sudden green thumb and she asked me to take pictures. So, here's my favorite of his summer plantings. I came home from work one day and he had planted buckets and pots full of bright summery things. Moss rose can always take the heat -- and usually comes up again the following year. Annuals seem to be a lot more iffy, even when they say "6 hours of full sun" on them (Somehow I don't think they're talking about the New Mexico sun). 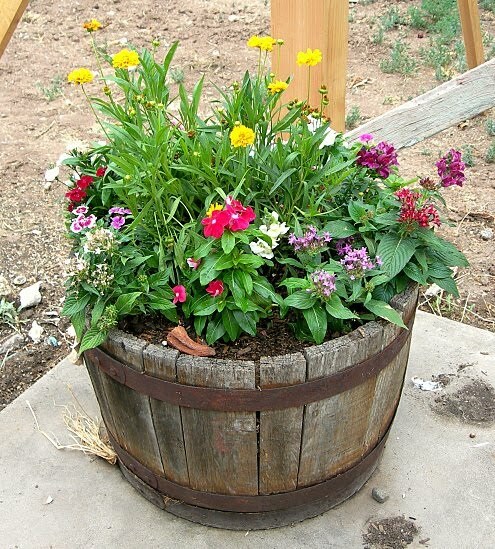 I was so amazed with the way he'd arranged this barrel of bright blooms -- and magically, it has stayed this way through the hottest summer days I can remember, even on our baking hot patio. Pardon the construction in the background, we are taming that baking hotness with a nice roof. That is not getting built soon enough for me. Friday night we threw a small going away party for two dear friends, and as I was tidying up before everyone came over, I happened to pick up this little pile of collaged cards I made this summer. Actually, I wasn't sure if they were finished but this one was on the top and it looked just perfect for them so I decided it was done. The paper is brown craft card stock. For the background, I cut out an image from a 1940's National Geographic, using deckling scissors. The proportions happened to be perfect for the craft card. Then I burnished on some rub on flourishes. I was not too pleased with the way the fourishes transferred at the right side, so later on I covered the booboo area with a handmade layered flower. I punched a larger flower from scrap paper, then with a dimensional foam adhesive dot I attached a smaller punched flower. The paper was leftover from my recycled envelope-making. 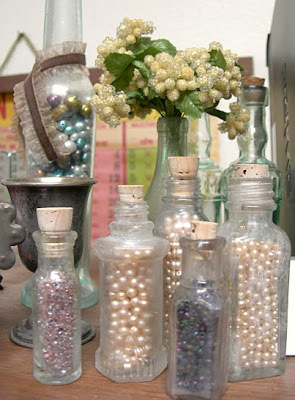 I also punched out 3 stars from a vintage book page, and glued on some pearl rhinestones. I attached the flowers with foam dots, too. 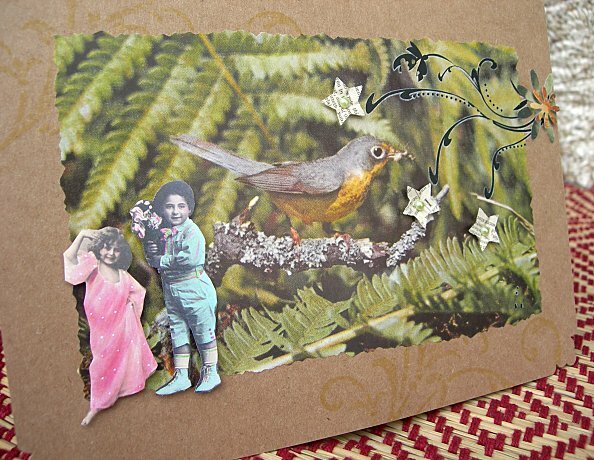 I cut out the girl and boy from photocopies of my vintage postcards. They had been reduced in size. I attached them with foam dots for a raised look. I used 2 different sizes of dots so I could raise their little arms and legs too! At some point I stamped around the background image with Staz-on inks, in subtle colors. I was toying with the idea of doing more stamping . . . This process might seem like a lot of effort and different steps and materials, but because I made several similar cards at the same time, it was a question of cutting and punching several similar items at one time, and then assembling them for each card. Everything except the birds were leftover from other projects. Nice way to build a theme and get a bunch of work done. I just kept adding each similar component to each card in the same order, with variations (e.g., I had several images of children in various sizes, placing them in different positions on each card), without really knowing where I was going. Or when to stop! LOL. Ashki used to make these sweet and sumptuous little treats when she lived in Albuquerque, now I think of her when I make them. Just slice the dates across the top and lift out the seeds. Then push in crumbled feta - she used to use goat feta -- and gently squeeze the date around the cheese. 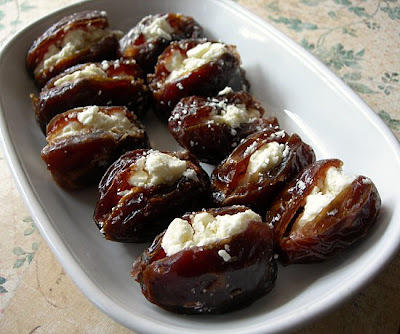 The dates are sweet like candy, and the feta balances it out perfectly! Returned from the DC area just last night, and shortly after, the MOTH presented me with his latest estate finds, including this little tribe of dollies from the 1950s. Three of them have crochet outfits from patterns that DMC produced back then, and the other is a blushing bride. I woke up this morning and this is how they had arranged themselves on my table, all resting peacefully. The front gal has apparently completed a rigorous round of chemo, while another -- Mary Queen of Scots in fact -- seems to have been beheaded. Hmmm. I should probably fluff them up a bit before I put them in my Etsy shop. I have been coveting those scrumptiously shabby ribbon and lace roses you see all over Etsy and so last night I googled how to make them. Being somewhat naturally rebellious, do you think I followed the instructions and used fabric that was appropriately pink and refined? Of course not. Well my choice was something of an accident. 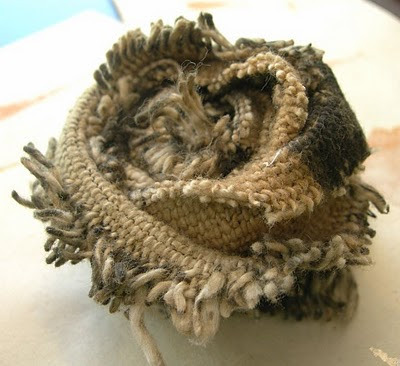 I was puttering around the "studio" this morning (that disaster area where I have to be careful not to bump into things lest there be an avalanche), when I ran across some mudcloth scraps Sarah sent me. Woman Made Gallery: Call for Artwork "Mothers"
"Mothers" seeks work by women in all media that addresses the culturally ubiquitous role of motherhood, historically under-represented in visual art. "Mothers" encourages multivalent understandings of this rich topic. Submissions might speak to personal experiences (as a mother or as related to a mother), social constructions of motherhood, the balance of home and work, the politicization of mothers, pregnancy, breastfeeding, childbirth, bodily transformation, miscarriage, loss, fertility/infertility, or other points of entry. 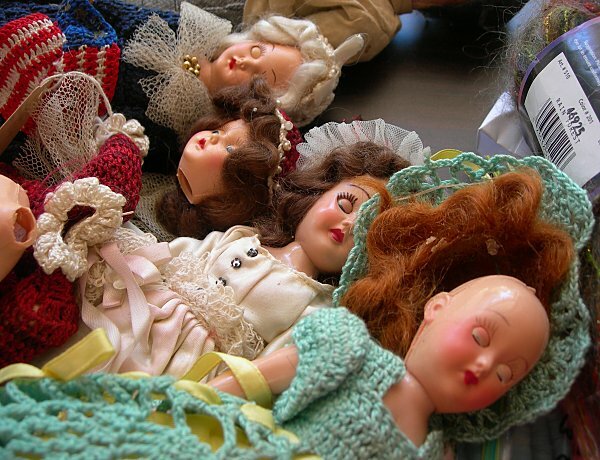 Open to all forms of art that investigate the theme of "Mothers." Rachel Epp Buller, Ph.D., is a feminist-art historian-printmaker-mama of three whose art and scholarship investigate this balancing act. Her prints have been exhibited in solo and group and shows in Kansas City, Chicago, New York City, and elsewhere and she lectures and publishes widely on issues of motherhood and the maternal body in contemporary art.